This is the village overview. It is where you can build resource buildings to increase production. Right now, you have absolutely nothing in it, and before we begin, lets get a little more information about it. 1. (purple): This is the list of resources you have, and the amount your storage can hold. You can not have more than the amount you can hold, and it is not recommended that you allow it to fill up, because that would waste resources. All the way to the right, there is a wheat with a slash in it. That is your population. Your population eats wheat so that amount is taken from your wheat production. That means that you are really making 12 wheat per hour, but it only shows you making 10 because 2 of it is being consumed as food. The number next to the 2 is the maximum amount of people your tiny village can feed, and it will stay that small until you increase it by upgrading your wheat fields. 2. (blue): This is the main view of all of your resource buildings. As your village grows, you will need to build more here, to increase production. Right now it is empty and will continue to be empty until we reach that part of the guide. There are four resources to be found on this map: crop, lumber, iron, and clay. All four are important, but wheat is something you should always have plenty of, since you need more the more people and soldiers you have in your village. 3. 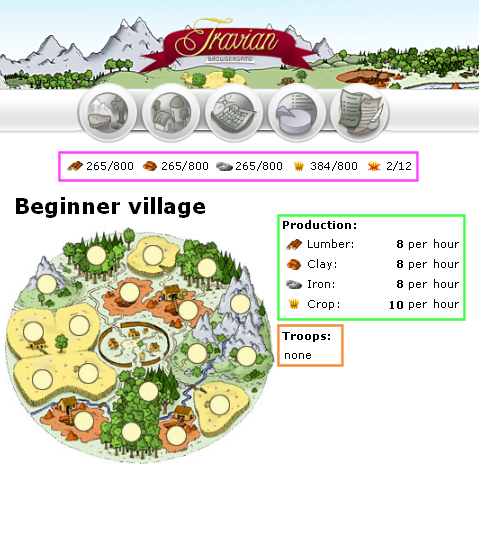 (green): This shows the amount of production your village does in an hour. As you build more resource buildings and increase their level, you will produce more. 4. (orange): This shows the units you currently have in your village. Since you just started and you haven't even built a rally point yet, there are none in your village. This is the village centre page. This is where you place your buildings. You can see that one building is already up, and that is the main building. The main building is one of the most important buildings you have, since it is needed for almost every building. As you can see, there are circles in your village centre, where you can build structures, but there are hidden places where you build certain things. 1. (green) : Mostly found on the river or around the rim, there is a place where you can build a wall to protect your city. Every tribe has a different wall, with different ways of protecting you. 2. (orange): This is where you can build your rally point. It is used to direct your units and also to instruct your catapults on targets. The higher the level of your rally point, the better your catapults are at hitting when you want them to. The rally point is also needed to build a barracks and other buildings, so without a rally point, you can not have any soldiers. This is the main map used for the entire game. In the centre of the map, surrounded by a yellow square, is your village. The other villages, which are surrounded by orange squares, are your neighbours villages. Blue squares are villages in your alliance, green squares are alliances that are allied with your alliance, and light green squares are NAPs. If you scroll over a village, like I have over my own, you can see details about that village, like the name of the player, the population of the village, and the Alliance of the village. If you click that village, it would show you more detail about the village, and give you options such as to centre the map on it, raid the village or send merchants to it. The blue circled square with the lake and the small wheat field is called an Unoccupied oasis. If you were to click on that small square, you would see information about it, such as how many wild animal were there and even have options like to centre the map at that location, or raid the Unoccupied oasis for resources. If you gain a Hero's Mansion in the future, make a hero, then level the Mansion to level 10, you could claim that oasis for yourself and gain a bonus from it, but you might not be ready for that until after you have been in the game for at least a week. 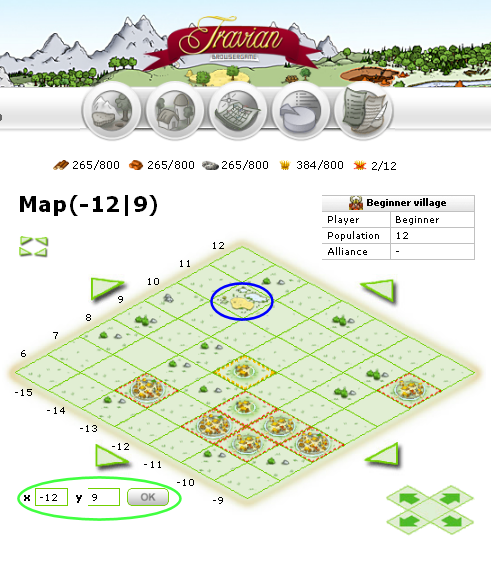 The green circle contains numbers that can be used like a short cut to your village. These are your coordinates. If you put random numbers in, like -29 and -82, you would find yourself at a random place on the map as described by them, almost like squares in a giant grid.